Access to green consumer products, from organic and natural foods to eco-friendly personal care and cleaning supplies, is growing daily, and many of these items are beginning to be available at some mainstream grocery and big box stores. Organic and sustainable clothing is bit harder to find, at least at brick-and-mortar retail stores, but that trend is growing as well. One industry that’s not so accessible, but is also ripe for growth, is the green building materials retail store. People want to be able to more easily purchase eco-friendly home decorating and building supplies, so this green business idea could reap both financial and environmental rewards. 1. 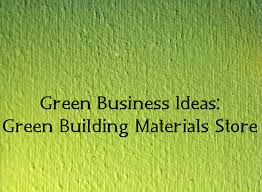 What is a green building materials retail store? Think Home Depot or Lowe’s, except that all the products are eco-friendly. It’s not an exact comparison, but a green building retail store typically sells countertops, cabinets, sinks, paints, plasters, finishes, floors, rugs, carpeting, etc., with the key difference being that all these things are healthy and sustainable products. comprises 13.4% of the $13.2 trillion U.S. GDP. This includes all commercial, residential, industrial and infrastructure construction. New commercial and residential building construction constitutes 6.1% of the GDP. will support 7.9 million U.S. jobs and pump $554 million into the American economy over the next four years (2009-2013). With this explosive growth, your retail store can capitalize not only on consumer interest but on interest from general contractors, architects, and designers in your area by providing them all the resources (and, potentially, consulting) they need to make their green building or remodeling project a success. Opening a green building retail store requires a person to be intimately acquainted with a wide variety of building/remodeling products, their uses, their strengths and limitations, and their perception by the general public and the contractors who will make up a good part of your customer base. Retail experience is also quite helpful, as organizing a good showroom is very important to allowing customers to see how beautiful and elegant their homes could look with all sustainable products. Being able to communicate well with architects as well as contractors as diverse as painters and cabinet installers is not an easy skill to acquire, but it is a crucial one for the success of this business. $$$-$$$$ (on a scale of $ to $$$$$) Other than renting a retail space to operate from, the biggest expense for starting a green building store will probably be buying enough products up front, so as to initially stock the shelves and give customers the ability to take home their purchases instead of just ordering them and waiting for them to arrive. Taking some classes or workshops in green building will help you to help your customers, so investing in some education could pay off in a big way. 5. What is the best location for a green building retail store? Urban (fair), semi-urban (very good), suburbs (very good), rural (poor). A key component to your success will be the location of your store. One of the most important factors cited by eco-entrepreneurs in this field was proximity to other building outlets, even big-box stores, where many customers will spill over to your business as they learn about your offerings. Do you have a background in sustainable construction/remodeling? Do you know LEED standards fairly well, or better, are you LEED certified? Is your area one in which a lot of building and/or remodeling is going on?